The two values of each language—code and name—do not show up in the frontend in the first instance. But you may apply them whenever it seems useful. The code value for instance is perfectly suited to be used for the HTML language attribute. We don’t need to stick to only two values. 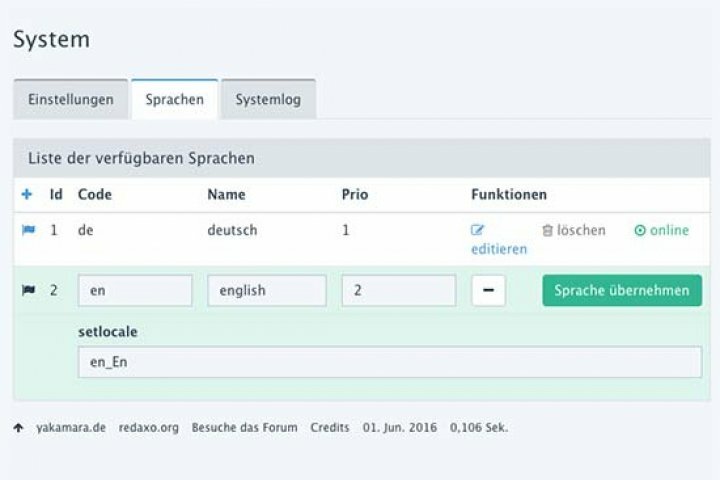 With REDAXO 5, meta fields for languages have been implemented. They allow for language specific features—like we already know from category metas, article metas and media metas. Depending on the structure of your website, you’ll need some type of “language switcher”. What should the link target be? Link to the same article in another language? Or better link to the home page? Do we have article content in all languages? If not, should we let the system fall back to the first language? Or better hide the link from the navigation? A link to the current article in another language will be sufficient. Like we said, alle articles and categories plus their meta values are available in all given languages. However, the media pool does not support this sort of replicated data. This is because a lot of files (like PDF) per se are not multilingual. In case you need multi-language support for the media pool, you can set up custom meta fields. The Sprog addon is used on the contact page and for the mobile navigation.